This is an ultra slim mini wireless keyboard with central touchpad. This is the latest version, with backlit LED, rechargable li-ion battery and ultra-comfortable silicone back. It also features a handy D-pad, perfect for media center use! 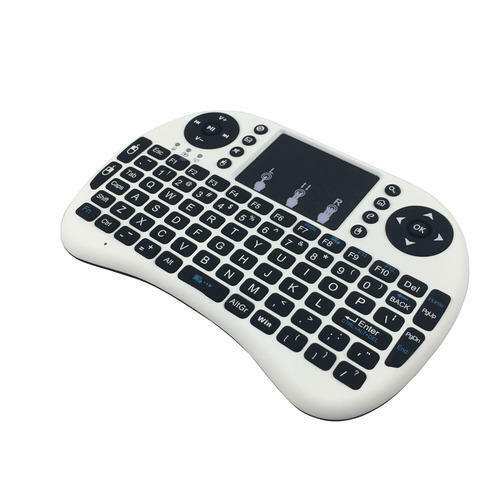 Raspberry Pi Wireless Keyboard makes commanding XBMC and traversing the Raspberry Pi console a breeze. The keyboard is soft-touch with excellent tactile feedback, so it's both comfortable and intuitive to type on. The mousepad is sensitive enough to control across large resolutions, but not so sensitive that you need a pin to aim it. It's also positioned so you won't accidently brush it when you're typing. It's been tested for full compatibility, and comes equipped with a tiny, low-current nano dongle, so there's no messy wires to trip over. This is an official Riitek product, not one of the many lousy imitation products that are on the market. It also features an internal rechargeable battery and USB cable, so just charge it up and you're ready to go!